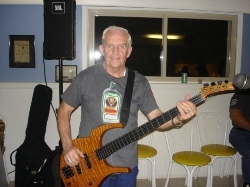 Tom did a few tunes on bass during FPB's evening gig on October 4th at the Lake Delta Yacht Club. 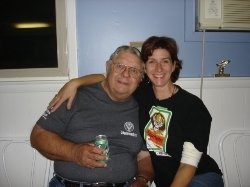 Fritz is shown here with Kari, during FPB's evening gig on October 4, 2008 at the Lake Delta Yacht Club. Fred is always happy to pose for a photo. Can't ya just tell? 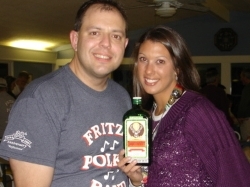 Here, he's pictured on October 4th at the Lake Delta Yacht Club with an FPB fan. 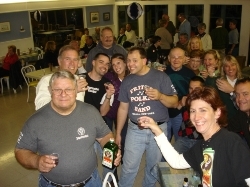 The guys in Fritz's Polka Band have a Jagermeister toast with some of their fans at the Lake Delta Yacht Club on October 4, 2008. 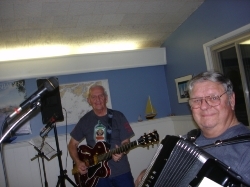 Tom and Fred are pictured here during FPB's festive evening gig on October 4th at the Lake Delta Yacht Club in Rome, NY. 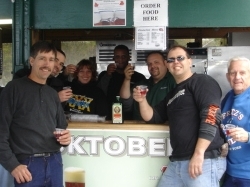 Frank, Rick, Fritz, and Tom toast some Jagermeister punch with Suzanne, Dave, and other Perthshire crew on October 4th in Amsterdam, NY. 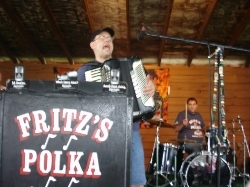 Fritz is pictured here during FPB's gig in Amsterdam, NY on October 4th. 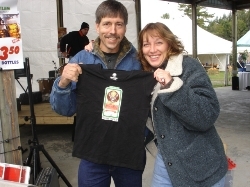 Frank presents Suzanne with a Jagermeister stretchy shirt, prior to FPB's gig for the Oktoberfest at Perthshire in Amsterdam, NY on October 4, 2008. 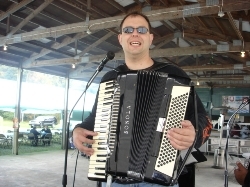 Suzanne booked FPB for the gig(Thanks, Suzanne!). 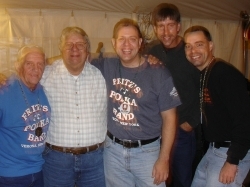 Fritz does the "Howly How" as he, along with Fred, Rick, Frank, and Tom pose with some FPB fans at the Oktoberfest at Pumpernickel's in Bolton Landing, NY on October 3rd. 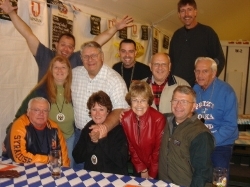 Fritz, Fred, Frank, Rick, and Tom pose with some FPB fans on October 3, 2008 in Bolton Landing, NY. 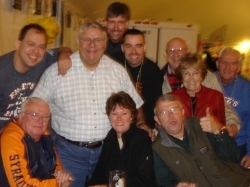 Tom, Fred, Fritz, Frank, and Rick are pictured here while on break at the Oktoberfest at Pumpernickel's on October 3rd. 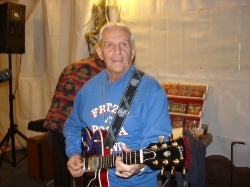 Tom is shown here during FPB's Oktoberfest gig at Pumpernickel's in Bolton Landing, NY on October 3, 2008. 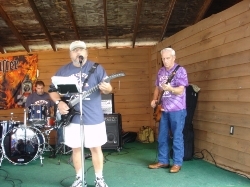 Special guest drummer, Mike Farraino is shown here with Gabe and Tom during FPB's second set on September 28, 2008 in Brookfield, NY. Tom and Fred are shown here on September 28, 2008 at the Wheel Days in Brookfield, NY. 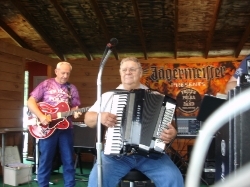 Fritz is pictured here along with special guest drummer, Mike Farraino, as they tear through a tune on September 28th in Brookfield, NY at the Wheel Days.